Part two of an essay about deep ecumenism, in advance of this summer’s Getting It…Together Multi-Faith Shabbaton. (Find part one here.) Steve and Brother Al will be teaching a week-long workshop at Ruach Ha’Aretz this summer, July 6-12, immediately following the Getting It Together Shabbaton. The main interfaith work we do is in presentations before multi-faith groups. It’s hard to put a label on what these presentations are — we use musical instruments, lots of candles and, bells and tibetan bowls, and we sing in English, Hebrew, Latin, Italian. We tell stories. We’ve been billed alternately as a class, a storytelling event, an experience of ritual, and yes, a concert. We kibbitz on-stage, finish each other’s sentences. I explain concepts of Jewish mysticism by referencing Jesus, Hafiz and the Desert Fathers as much as the Baal Shem Tov, and Brother Al tells a Shlomo Carlebach story and tosses off Yiddish phrases like the Italian boychik from the Bronx he is. It’s very different from any class or concert or service. What Brother Al and I are accomplishing begins with us simply walking onto a stage together — me wearing a kippah, him in his brown habit. At interfaith gatherings, we ask to be presented together, not as Catholic or Jew, but as Song and Spirit. Any topic we pick has their immediate attention because no one has ever seen two guys who look and sound like us standing together, teaching one moment, joking the next, harmonizing on a song the next. When we explore and compare the roots of familiar prayers — the Christian Our Father and the Jewish Kaddish — the Christians are riveted by hearing their most common prayer in Hebrew or Aramaic.The Jews in attendance take pride in the fact that they have a group of prayers so perfectly suited to comfort, praise and exalt, and are happy to teach others of it’s importance. As each group finds that the rhythm and words have so much spirit/ruach in common, walls come tumbling down. Jews develop a better understanding of Jesus as a Jewish teacher and leader — gain respect for his mission, understand what he was trying to accomplish in his life and how that fits into Jewish history. And Christians have the opportunity to hear the language Jesus spoke, to place his actions and teachings in historical and cultural context and feel connected to the significance of his very human life as a Jew in his own time, before Christianity — while he was still Rabbi Yehoshua. While preparing to present this comparison of The Lord’s Prayer and Kaddish as part of a program on Holy Thursday at a local Unity church, we were struck with an even more radical idea. And so we crafted an entire presentation — songs, teaching, candles, bells, etc. — heading toward a conclusion where we would invite the entire audience to stand and say kaddish for Jesus. We had never heard of any such thing ever having been done, so I called Reb Zalman and asked for his advice. I had not thought about the burial kaddish since the only time I had read it — at my father’s funeral. But, indeed, it included text that would resonate with a Christian audience, words that would honor both the Jewish rabbi and the Christ he later became. Brother Al and I discussed what it meant for us say kaddish now for the The Master, after all these years. What did it mean for us to offer prayers to benefit the soul of the one who has come to be seen by so many as the soul of the world? This was easily the deepest we had gone in thinking about the human-ness of Jesus. And so, at Renaissance Unity, on Holy Thursday 2013, during the week of Pesach, I asked over 250 people to rise and repeat after me as, for perhaps the first time in 2,000 years, we recited kaddish for Rabbi Yehoshua ben Miriam. The handful of Jews in attendance told me afterwards they had goose bumps. That an entire auditorium of Christians was chanting yitgadal v’yitkadash for Jesus simply blew them away. Yet the most interesting and gratifying ongoing project we’ve developed has to be our Interfaith Havdallah. It has become clear to Brother Al and myself that what consistently draws our attention spiritually are moments of transition, liminal moments — Sinai, Pentecost, Kabbalat Shabbat, the mystery of the Eucharist — those moments when kadosh and chol touch. Avraham sitting before his tent, Elijah at the cave, Saul knocked off his horse. We’ve explored the idea of icons (the vertical representation of YHVH, the Christogram, etc.) serving as doorways between worlds. So it was natural that we focused our attention on havdallah, on the moment of separation. “But there’s no special ceremony? No ‘Let us welcome the day of the Lord’ or something? Talk about a challenge. We began to think about the components that would go into a dual service, one that would close out Shabbat and then open the Lord’s Day, handing off sacred time one to the other. It had to be a thoroughly Christian version of Kabbalat Shabbat, but not much longer than havdallah, since we couldn’t expect long attention spans for something so completely new. We looked at traditional Vespers prayer. Too solemn. We needed joyful songs to go with prayers, we needed Christian nigunim. Brother Al insisted that we also needed to include a moment of thanks to our Jewish brethren for keeping the sabbath so faithfully all these years. “We should sing back and forth to one another,” he said. So we did it. Brother Al wrote an opening melody, then wrote new lyrics to the old folk tune “Shalom Chaverim” that we could sing back and forth to each other in a round. We included a Magnificat nigun, a taizé song as our intercessory prayer, and I wrote the song welcoming the Lord’s Day, based on a verse from Isaiah. We opened with a brief Jewish service before havdallah to give balance to the whole evening. Before I extinguish the havdallah candle, I light Brother Al’s candle of welcome. After a moment of silence, we begin, singing, “Rejoice, rejoice, the sun has set in our midst, and a new day has begun.” Thus we begin to teach the Lord’s Day, not the Lord’s Hour. We hold this service once a month. It is an extremely powerful experience. Long-time interfaith couples, who have been supporting each other for years — at one’s church and the other’s temple — tell us that it’s the first time in their lives that they feel like they’re worshipping together. The point is that this is not a blended prayer service; we’re allowing people to pray in one another’s company, while maintaining the integrity of each tradition. At the same time, we’re giving Christians the ability to mark sacred time, to keep a version of Shabbat, as Jesus required them to. We call the Lord’s Day candle DomeniCandela — a Sunday candle — and our hope is to promote its use among Christian families and congregations, regardless of whether it’s tied to a Jewish havdallah or not. It’s a powerful expression of community and offers the same gift of rest and peace that has been our most treasured possession all these centuries. This is clearly among the best practices that yiddishkeit has to offer a stressed-out world. And none of this would ever have happened — not havdallah, not kaddish for Jesus, not this new vision of interfaith, spiritual info-tainment — if Brother Al and I had not caught each other’s fancy, if we hadn’t been willing to take a bit of a spiritual walk on the wild side. 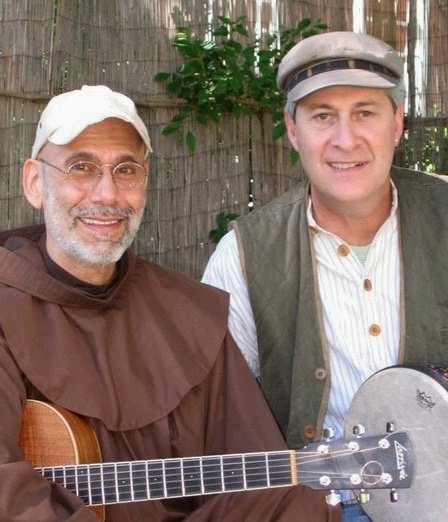 What I’ve learned from this relationship with my Franciscan brother has made me a better Jew, a better teacher, a better storyteller, a better person. We are constantly exploring the boundaries of what we believe, of how we travel the dual roads that we are traveling. Far from being threatening, we gain new vitality from the connection. Reb Zalman says, “You can’t get all your vitamins from one bottle.” So true. A candle loses nothing by lighting another candle. Ner Yah nishmat adam. It is an illusion to think that there are 6 billion soul-flames burning in this world. There is really only one flame, burning in 6 billion places. The closing song of our interfaith havdallah is called Be Holy, Hear the Whisper. The refrain is “hakadosh baruch hu, sanctus dominus.” At the end, Brother Al turns to me and says, “Shavuah tov.” And I wish him a good Shabbos.